OK, just kidding. I’m Chinese, lived in suburbia and never saw an orchard as a child. It wasn’t until a few years ago, my Mississippian family showed me what deliciousness I had been missing. It isn’t rare to find various renditions of this classic southern pie while thumbing through recipe books found in old cupboards and pantries. 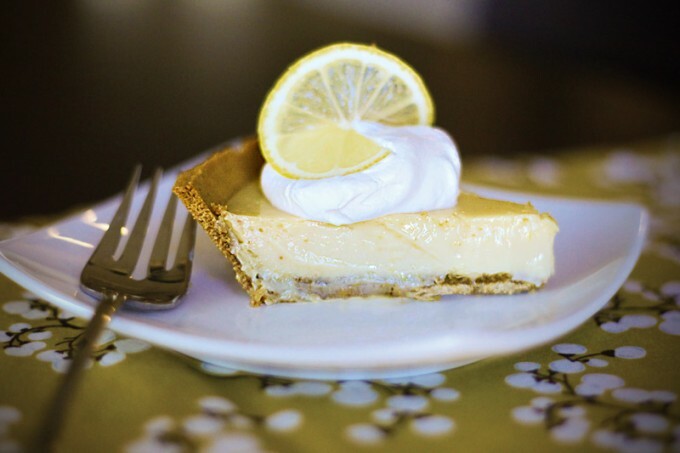 This summer pie is a common standby down there, particularly when there’s a craving for a refreshing treat when the temperatures run high. Lemony rich and ice box cold, I’m surprised it’s not more common here in Texas where we have over a month of 100 degree days. For the crust, break the graham crackers into small pieces and place in the bowl of a food processor along with the sugar and salt. Pulse 8 times, until the cracker crumbs are semi-fine (they shouldn’t be powdery but not in large shards either) and the crackers and sugar are combined. Pour in the butter and pulse until the butter is blended in and the mixture isn’t crumbly and holds its shape when you squeeze it, about twelve 1-second pulses. Transfer the crust to a 9-inch springform pan and push and press the crumb mixture into the bottom and two-thirds of the way up the sides of the pan. Use the bottom of a measuring cup to press the crust into place. Set aside. For the filling, whisk the condensed milk with the lemon juice and set aside. Whisk the zest with the egg yolks in a medium bowl until pale, 30 to 60 seconds, and then whisk in the lemon juice-condensed milk mixture. Place the springform pan on a rimmed baking sheet, pour the mixture into the crust, and carefully transfer the baking sheet to the oven. Bake until the center jiggles slightly, like a soft-setting custard, about 25 minutes. Remove from the oven and cool for 1 hour on a cooling rack. Loosely cover the pan with plastic wrap (be careful not to let the plastic wrap touch the top of the pie) and freeze for at least 6 hours or overnight. For the chantilly cream, pour the heavy cream into the bowl of a stand mixer (or in a large bowl if using a hand mixer). Add the vanilla and sift in the confectioners’ sugar. Whip on low speed to combine and then increase the speed to medium-high and whip until medium-stiff peaks form, about 1 1/2 minutes. Before serving, wrap a wet, warm kitchen towel around the edges of the springform pan to release the pie from the pan’s sides. Unclasp the pan and remove the pie. Fill a pitcher with hot water, dunk your knife in, wipe off the blade, and slice. Top with a dollop of chantilly cream and serve immediately, or keep in the freezer for up to 1 week.